Calgary is an incredible city. We try to get down there a few times throughout the year—primarily to eat our way through their endless list of delicious restaurants. And now Tourism Calgary and the Calgary Hotel Association are making a trip to the city truly irresistible by offering a really wicked downtown hotel + shopping deal you can’t miss! Starting Oct. 1, 2018, you can book a stay at a Downtown Calgary Hotel and receive a $75 gift card to shop at CF Chinook Centre, Cross Iron Mills, or The CORE Shopping Centre, PER NIGHT OF YOUR STAY! I partnered with Tourism Calgary to highlight this awesome promotion on my blog and social media. Mike and I spent a weekend in the city, staying at the Calgary Marriott Downtown Hotel, dining all over the downtown core, and shopping at CF Chinook Centre, using the gift cards we received as part of the hotel + shopping promotion. Pin + share this post to spread the word about Calgary’s awesome Stay + Shop Deal! The hotel + shopping deal can be redeemed at select downtown Calgary hotels from Oct. 1, 2018 through to Feb. 28, 2019. Be sure to check the Tourism Calgary website for the full list of participating hotels! 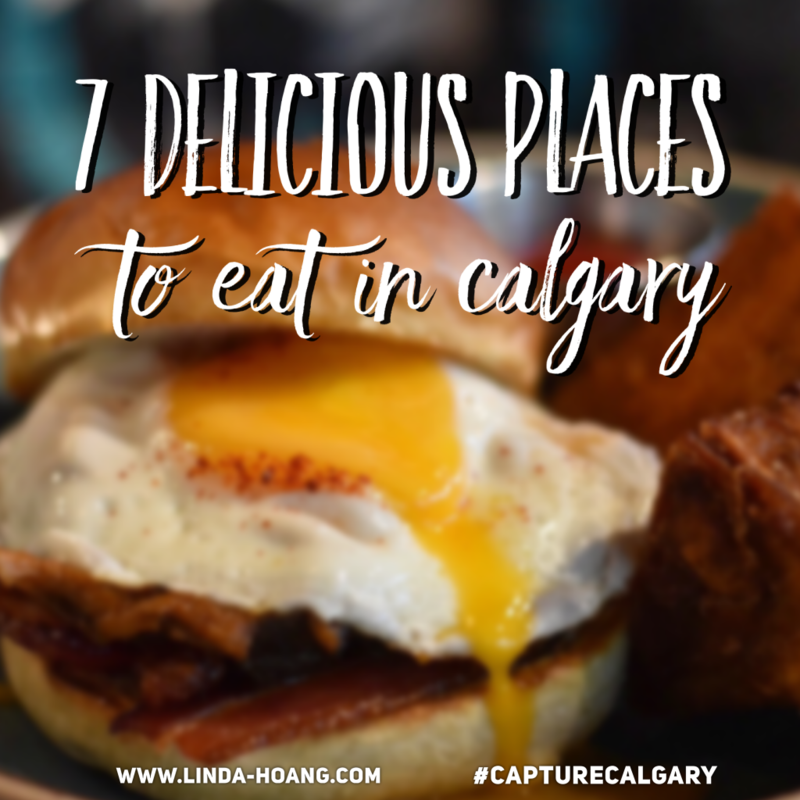 Pin + share my post about 7+ delicious places to eat in Calgary. Here a few awesome restaurants we tried during this recent trip to Calgary, that you should consider when you go! Feel free to copy this eatin’ itinerary exactly! Tableside barrel smoked Old Fashioned at One18 Empire in the Calgary Marriott Hotel Downtown. One18 Empire located in the Calgary Marriott Downtown (right next to the Calgary Tower!) is a whisky bar featuring nearly 300 whiskeys, ryes, bourbons and scotches. They have something called an ‘Old Fashioned Central’, where you can Build Your Own Old Fashioned! Mike picked the Knob Creek (featuring apricots, nuts apples and toast for the nose, and a rich, sweet, chili pepper and cinnamon palate), Peach (ripe peach, spice and bitter almonds), Cherry and Maple Sugar combination. 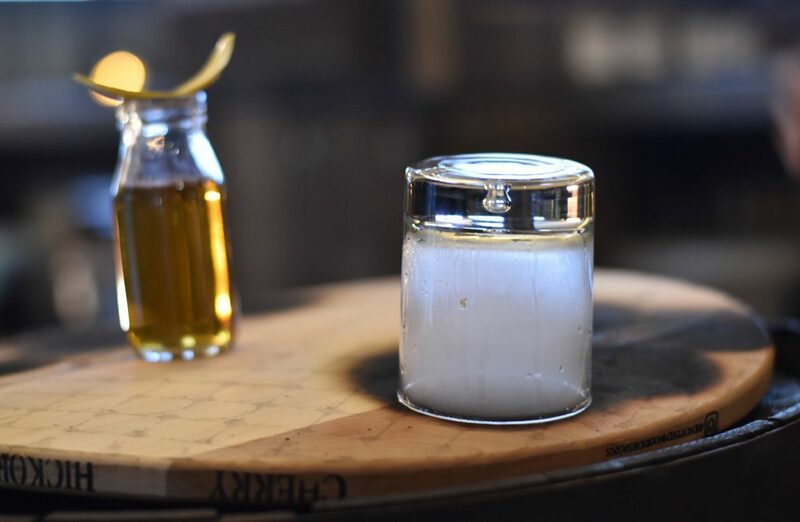 For Old Fashioned Central, they roll a barrel over to your table and barrel smoke the drink right in front of you. Along with an Old Fashioned Instagrammable Wall, One18 also offers breakfast, lunch and dinner. I thought my seared diver scallops with pork bellyo n creamy polenta and mustard jus ($19) was delicious (seriously, scallops and pork belly are the perfect pairing!) and Mike I also enjoyed his seared salmon on baby bok choy. 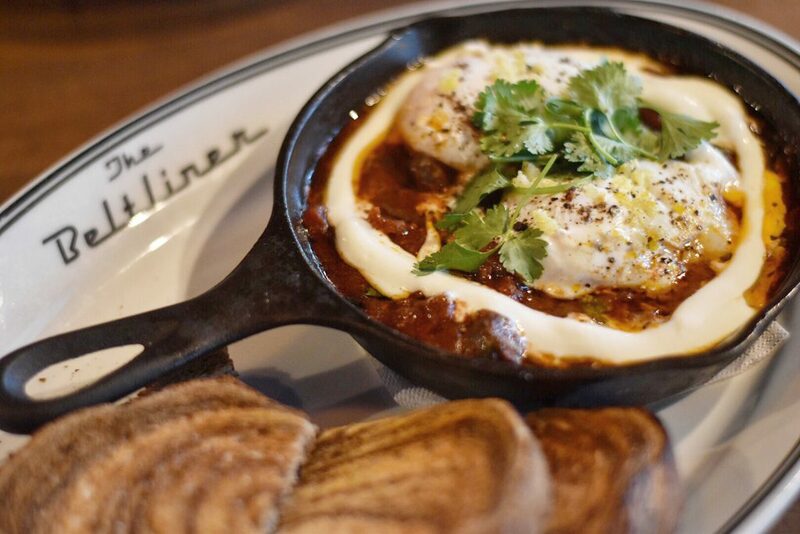 Lamb Merguez Sausage, Eggs, and Tomato Stew from The Beltliner in Downtown Calgary. A popular breakfast spot, located in one of the shopping deal participating downtown hotels the Fairfield Inn, and in walking distance to many of the other participating hotels, The Beltliner is named after the old streetcar that ran down Calgary’s 12th Ave in the early part of the last century. It’s a modern, classic diner, where Mike tried their daily special—a pulled pork breakfast sandwich with fried egg and hash browns, and I tried their Lamb Merguez Sausage and Eggs in stewed tomatoes with toast ($19). The hash browns at The Beltliner were unlike any we’ve tried at other breakfast spots—they’re thick, single cuts, with a crispy outside and a somewhat potato pave-style stacked inside. We really liked it! The Beltliner also has a small to-go coffee counter featuring Fratello coffee, Cru Juice and housemade pastries and snacks. 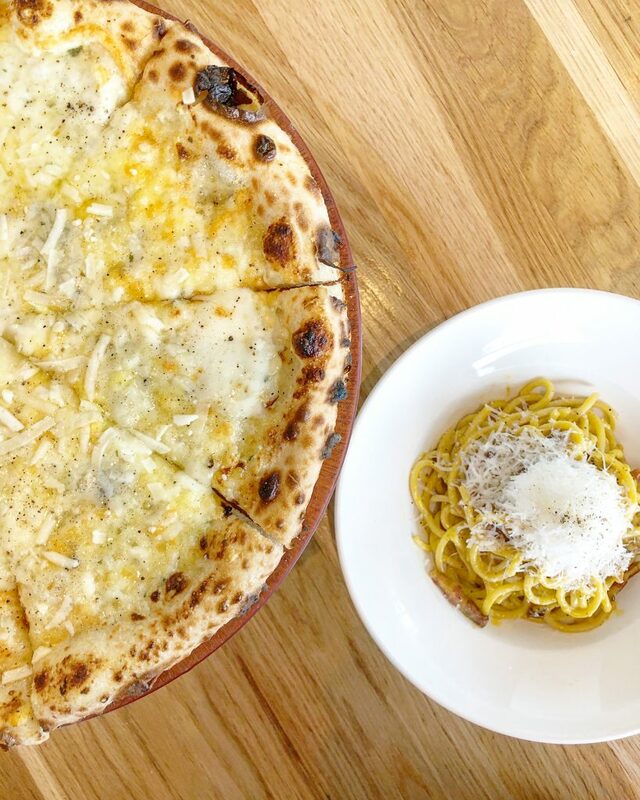 Six Cheese Double Zero Pizza and housemade Spaghetti Carbonara Pasta from Double Zero Pizza in CF Chinook Centre! Pizza and pasta—it’s the perfect pairing, and at Double Zero Pizza, they make both in-house, so the quality is just lovely. We went to Double Zero Pizza’s CF Chinook Centre location, so after a morning of shopping, grabbing a hearty meal here was perfect. The Caesar Salad was seriously one of the best we’ve had in a while ($11 for a small size that’s pretty large), I think it was the lemon anchovy dressing and pancetta that elevated this for us. Mike got the Six Cheese Pizza featuring garlic cream, fontina, gorgonzola, asiago, fior di latte, mozzarella, pecorino, parmesan, lemon honey and black pepper ($20) and I got the Spaghetti Carbonara with pancetta, egg yolks, pecorino and black pepper ($20). These are well-portioned and real tasty. Normally I use any pizza as an excuse to go crazy with toppings, so I was skeptical about just a cheese pizza, but this was real good (if you like blue cheese!) The pizza is thin crust, made with hand rolled fine grade ’00’ flour dough, cold fermented for a minimum of four days, which adds an airy texture and soft crust. We really enjoyed Double Zero Pizza. Delicious macarons from Ollia Macarons and Tea! Welcome to the cutest little macaron and tea shop in Calgary! Ollia makes the most delicious macarons—perfect little French pastries, with almond meringue shells and ganache, buttercream, jam or cream cheese fillings. Even better than the ones you can buy? You can learn to make them here too! Ollia offers a Macaron 101 baking class, which is $100 per person for a 2-2.5 hour class, includes sampling their macarons, drinking tea, learning about the history of the macaron, and of course—making your own macarons and taking home 30 (!!!!) of the ones you’ve made. It’s awesome value and David Rousseau, the instructor and co-owner of the shop, is awesome. While you’re at Ollia, pick up some tea too. P.S. Ollia macarons are sold in Edmonton at Fan Fan Patisserie and Bon Ton Bakery—woot! Seriously, the best tomato burrata salad from Bread & Circus Trattoria. Photo credit to Bread & Circus because my camera did not take nice photos in their dark-ish restaurant lol. Three Words: Tomato. Burrata. Salad. You MUST!!!! Bread & Circus is a fairly new restaurant on 17th Ave., that’s part of the same group behind the awesome Una Pizza + Wine and Una Takeaway. The cool part is that Bread & Circus is located behind Una Takeaway (inside the same building), AND there’s another restaurant Frenchie Wine Bar located behind Bread & Circus! It’s like neverending deliciousness. Cool building and use of space aside, Bread & Circus is serving up delicious Italian eats. As I said, the Tomato Burrata Salad ($22) is a must-order (honestly, order two. 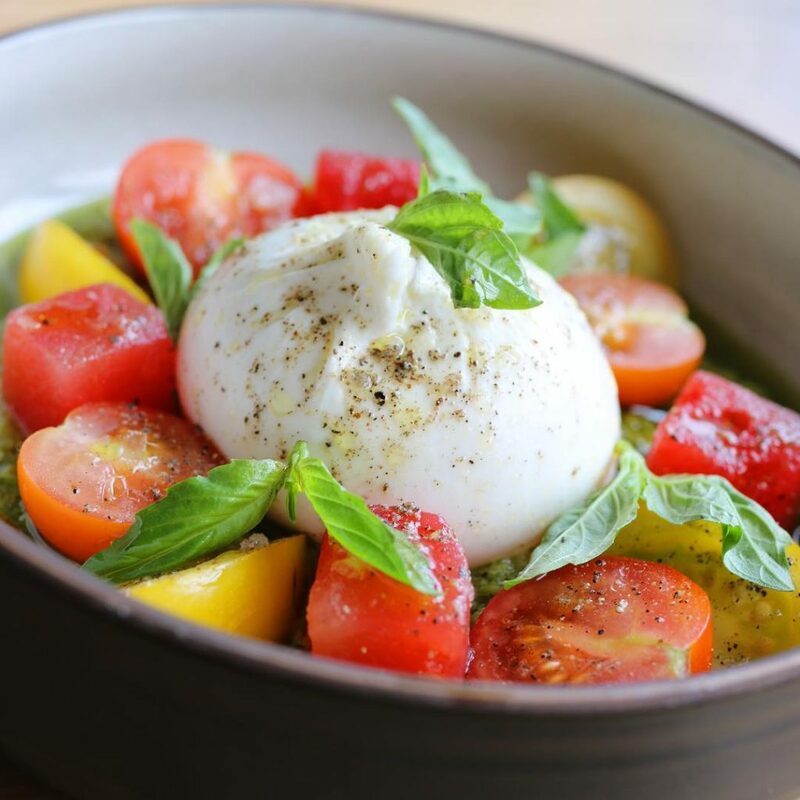 You will NOT be disappointed), with tomatoes, burrata cheese, watermelon, and a delicious basil pesto. Another dish I’d order two of: their Romanesco Salad ($12). It comes with romanesco broccoli and a mushroom vinaigrette that you could drink, it’s so good. Their cacio e pepe popcorn is addictive. And their housemade Amatriciana (bigoli noodles, tomato sauce, chilies, guanciale and pecorino romano – $19) was delicious (especially the sauce!) 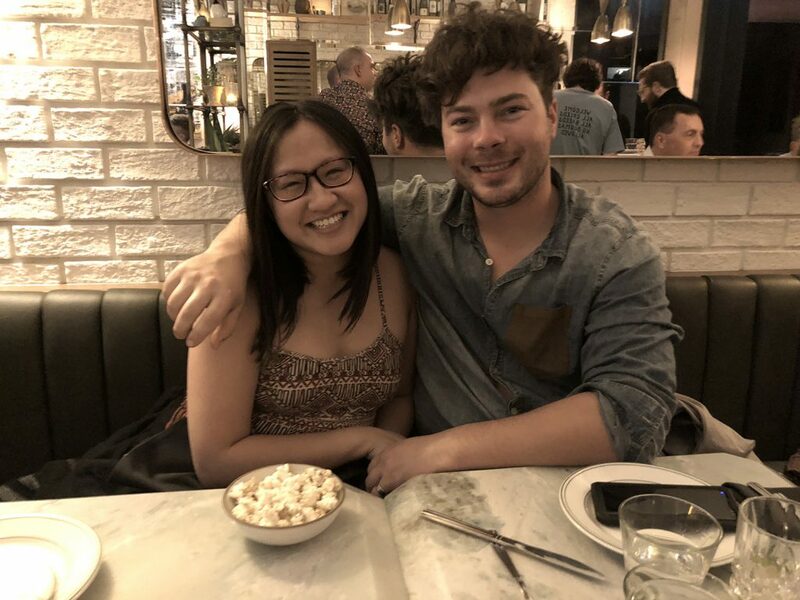 It’s dark in here though (only downside), so this image of their Tomato Burrata Salad was taken from their Instagram instead of the crummy one I got on my camera, lol, but here’s a photo of me and Mike in the restaurant! Mike and I at Bread & Circus Trattoria behind Una Takeaway (and in front of Frenchie Wine Bar). Such a cool place! The delicious Bureka Plate (front) and fried egg sandwich (back) from Sidewalk Citizen Bakery in the Simmons Building. Famous for their sticky buns and fresh-baked daily breads, Sidewalk Citizen is a perfect stop in the East Village for some pastries or what we had—breakfast! The fried egg sandwich with bacon, arugula, roasted garlic mayo, and tomato jam on a brioche bun is the perfect breakfast bite ($10.50). 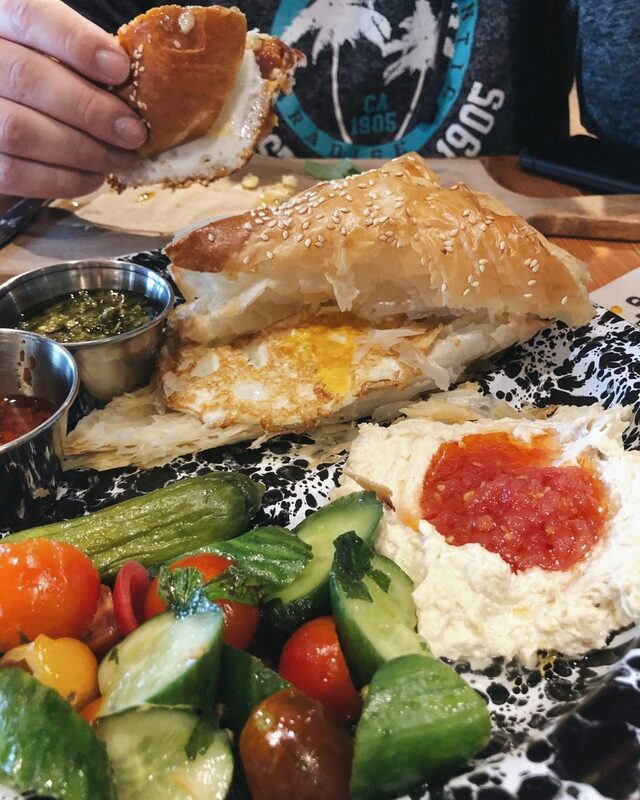 I loved their Bureka Plate—a puff pastry pocket filled with feta, cheddar, and fried egg, plus hummus and harissa (hot chili pepper paste), Israeli salad, grated tomatoes and pickles ($9.75). You can get a delicious, light meal at Sidewalk Citizen for a pretty affordable price. Sit-down or take it to go as you walk around this awesome neighbourhood by the river. Royale Restaurant was one of the stops on our 17th Avenue Food Tour! It is one of many Calgary restaurants with GORGEOUS interiors. 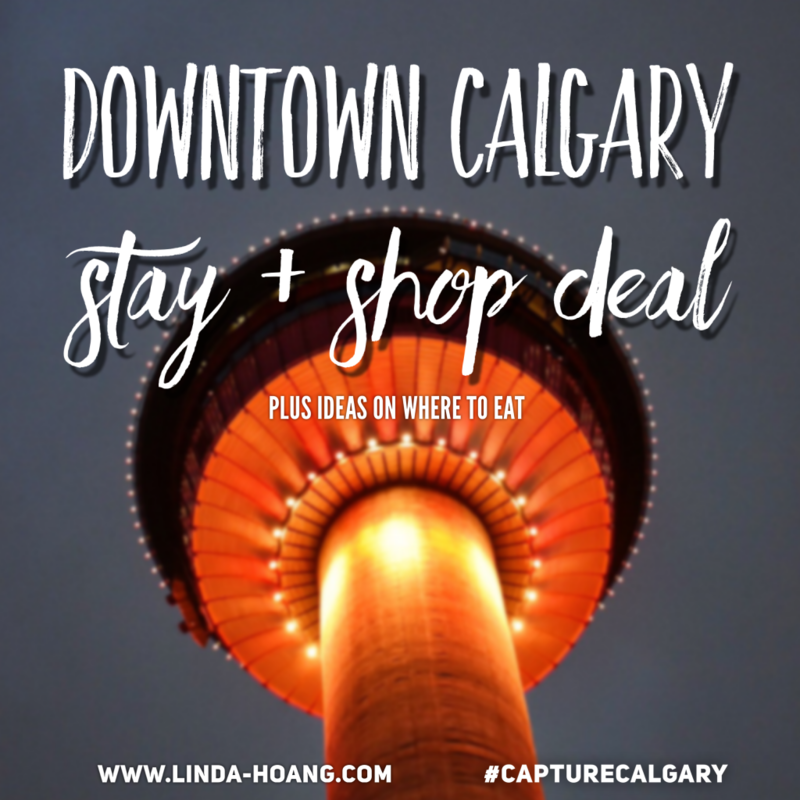 So as usual, Mike and I had an awesome time visiting one of our favourite cities, and previewing what your downtown Calgary itinerary could look like, if you book at one of these select hotels and receive the $75 per night of your stay shopping deal! I seriously think it’s SUCH a good deal, like the value is awesome. It would be silly to miss it… so don’t! Check out Tourism Calgary’s Downtown Deals page to browse and book your hotel + shopping deal! Can you tell I love the city?! 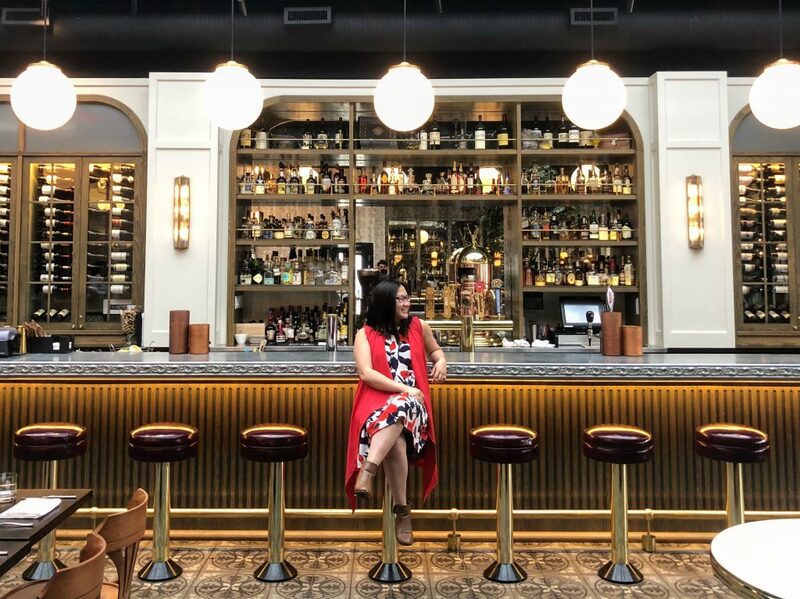 Disclaimer: This blog was posted as part of a paid partnership between me and Tourism Calgary—aimed at highlighting their awesome hotel + shopping deal! My experiences were complimentary as part of the partnership. This has no impact on opinions stated in this post. Calgary is one of my favourite cities to visit and I love a good deal!